Mr. Peter Good is the Bar Manager of Catch Dubai, a fantastic New Yorkers concept situated in the Fairmont Hotel on SZR. 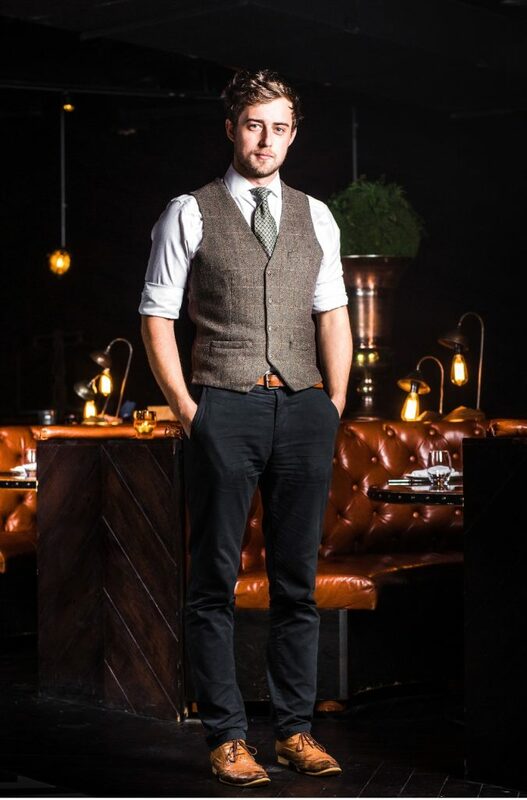 Before coming to Dubai last year he was working for some exceptional Speakeasy bar of England such as Hyde & Co and HausBar. He mostly specializes in 1800’s and 1900’s classics together with a modern twist of his own creation. I had the opportunity to work together with him and he amazed me by his knowledge and customer service. We had a great chat about the Dubai Market and the UK market and what possible we can do to contribute to making it better. LG: After one year how do you see the Dubai Market? LG: What does bartending means for you? Peter: Bartending is so much more than people think it is, for me it’s a career path, not just a job, people these days like using the term mixologist which has almost become a dirty overused term amongst certain people, in my a opinion, mixology is 10 % bartending, To be a good bartender you have to have exceptional customer service, be efficient, clean and helpful behind the bar, have exceptional knowledge of everything you service and amount other things, of course, great mixing skills. 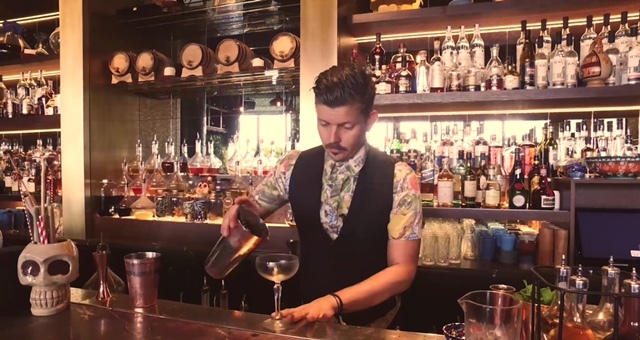 Although I think a lot of knowledge and passion is still needed in Dubai, it is doing incredibly well for such a new city with this many bars and the level is only getting better and better by the day and there now some incredibly knowledgable bartenders in the city that are happy to share their knowledge amounts to others which, is always great to see. Many people are here for many reasons but very few are here for a career and plan to stay in the industry for the long term it seems, but that will slowly change as the city matures and settles in amongst the bartending world. LG: What your advice for anyone that wants to start bartending? Peter: You can always learn the drinks, you can study to gain knowledge, you can acquire the right skills with time but you need that personality that will want to drive you to do those things. True, genuine, organic customers service is usually something people naturally have. It’s about engaging with the guests in front of you judging how they want to be served. Sometimes telling facts and stories about the drink works, sometimes making them laugh works, others, sometimes, genially, want to be left alone and not talked to, but it’s up to you to judge the situation and tailor what you do to make the best of out it. LG: Are we having same product behind the bars between the two markets? 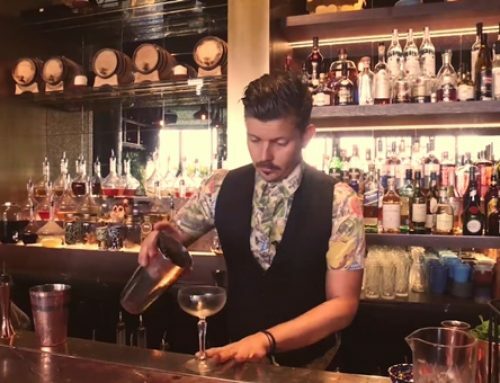 Peter: When I arrived, I found out quickly that Dubai has, to my surprise, a lot of good products in the supplier’s portfolios but it’s difficult to get those super niche products that you get in the UK that we bartenders crave as we forced to buy from MMI & A&E. But even over the last year, I have noticed more and more variety of products coming in which is definitely good for the industry. LG: Whats the Dubai ‘trend’? Peter: It’s very difficult to say, on one side, I noticed is that the trend over here is still in the Grey Goose, Patron, passion fruit and lychee drinks, Johnny Walker and Chivas which in England would seem ‘dated’ now in a lot of the high-end bars, but on the other hand a lot of people are trying different drinks that you sometimes don’t expect. 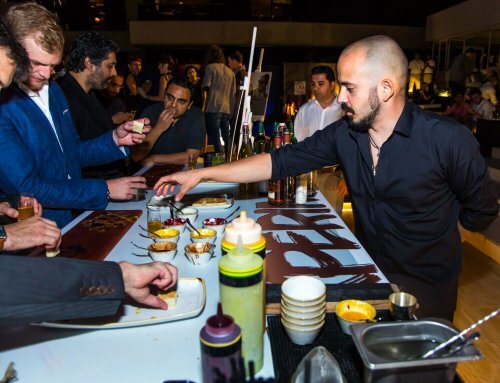 As Dubai is so multicultural, one you might be selling Grey Goose and Soda all night but the next night you’ll be selling martini’s made in all different styles and along with all your signature drinks. It’s incredibly hard to pinpoint what is considered ‘trendy’. LG: What’s the new trend now? Peter: I like to think the liqueurs and the bitters are making a comeback, especially in cocktails, off course Campari is taking the advantages of it and leading the way as it is huge over here. These days you will see a decreasing amount of vodka and fruit, including purees, syrups and juices in drinks and increasing about of vermouths, bitters, infusions and amaros to compliment the base spirit and enhance certain flavors. I have always had this theory that people go out to try curtain’s things they can’t have at home, but this goes back right to the beginning of time. But let’s start with, let’s say to make things simple so you get the idea, the cosmopolitan, I imagine people didn’t know how to make it at home and products like Triple Sec weren’t commonly available in shops so people go out to drink them, when people can easily make them at home, people stop buying them in the bars, so the bars up there game and might start getting the tropical fruits in, like passion fruit and lychee, so then bars are starting to do the fruity drinks and the more tiki drinks, but then the shops start having them, so the bars are starting to use unique spirits, vermouths, and amaro’s, and now they are commonly available in shops, so bars start the infusions and the there of distillates etc.. That’s a very simple explanation but I think you get my point, so it’s a market that keeps on evolving, similar to the food industry. Peter: If I knew the answer to that Luca, I would be a millionaire… which I’m not by the way. LG: What’s your philosophy when you create a drink and a menu? Peter: When creating drinks, I always tend to search for flavors in the spirits and bring them out, enhance and then compliment them on giving a very ‘genuine’ flavor that I’m trying to create. I know that may sound very pretentious and ‘bartendery’, but after all, that’s what I am and I can’t think of another way to describe it. In regards to the menu, they should be balanced in the sense that there is something for everyone, even if that person doesn’t know it. So there should be a variety of long drinks and shorter boozier drinks but within those varieties of flavors using a variety of spirits, techniques, garnishes, glassware and complexity. As I said before, I like to have something for everyone. You may be surprised but a good menu can take months and months to balance and get right, and usually by the time you bring a menu out, you start writing the next one. At the moment I am creating the new menu for Catch so I base it on a theme of old school New Yorkers style. We are creating a really fun vermouth infusion program that will hopefully continue over the next few menus, some as simple as strawberry vermouth but others more along the lines of a herbaceous ‘chartreuse’ style infusions. And as much as I would love to take credit for everything and all the cocktails, it is a very communal effort to make a menu as the whole team but involved and we help to develop each other’s drinks for the menu. It’s very rare the good drink is made on the first attempt. If I would make a menu for myself, the drinks would be much different from what people would like, it’s easy to place a passion fruit martini and a raspberry mojito on the menu because you know, for sure, that will be a big seller but it’s not what it’s about for me, it’s about having a very balanced menu where all drinks, ideally, should sell evenly and the hope that people will try something new that perhaps they don’t know they will like until they try it. Lastly, the menu should visually have some attraction, sometimes a classic menu works with the venue, but I always like to add a theme to the menu in some way or another. LG: Are you judgmental when you go to another bar? Peter: Yes of course, any bartender that says otherwise would be lying, it’s unofficially part of my job as well as a passion of mine to go and check other venues and try their drinks and talk to the bartender, I always look for everything when I go to another bar almost whether I like it or not. I go to bars for all sorts of reason, something I like to go to a high-end cocktail by myself bar and drink a few manhattans and have a chat and laugh with the bar guys. Other times I might go to a bar with a group of people and not necessarily sit at the bar, but just enjoy my company, the service and the atmosphere. There are so many reasons I go out drinks and many reasons why I choose the bars I go to. I would consider a ‘good’ bar, as a bar I can go in myself and not feel lonely, does that sound weird…? Another thing I always say about bars is, a great bar will always make a bad drink taste better but a great drink in a bad bar will always make it a bad drink. LG: What do you drink when you do it? Peter: It massively depends on where I’m going and who I’m with, but mostly beer, at work people mostly think I would go out and sip on Martin Millers Westbourne martini’s with drops and this and that vermouth, but most likely you’ll see me with a beer, a Manhattan and a shot. LG: Are we missing any product in Dubai? Peter: Yes and no, we have a very large selection here in Dubai but I’m pretty sure we can make do with what we have got, but I still feel like it could do better sometimes. The main issue is price, using anything above house pour spirits and then using some other unique alcohol can very quickly push the price up of drinks beyond what people would feel comfortable paying. LG: how are the bar standards here in Dubai? Peter: The venues are incredible, a lot of money goes into making a venue look beautiful and unique and the average level of service is much high. For example, every venue would usually have a strict service manual they have to follow to maintain the level of service in the venue. I am not used to having them in the UK as many cocktails bars would hire you ‘your’ style of service. LG: Any cocktail and food pairing? Peter: I very seldom pair cocktails with food. If I have a cocktail I usually have one because I want one with my food, but necessarily because I think it will match perfectly with what I am eating. That said, an Adonis (Equal parts fino sherry, sweet vermouth, a dash of orange bitters and, an optional dash of absinthe) with a steak always work well for me. LG: One recipe that represents you? Peter: Definitely a Sweet Manhattan, it blew me away the first time I had on. The way I like it is; 40ml Rittenhouse 100 Rye whiskey, 20ml Cocchi Di Torino sweet vermouth, 2 dashes of Angostura bitters and a bar spoon (~5ml) of Maraschino.